← Dinosaurs of Creation – 4000 B.C. At 8:42 A.M. October 12, 1974 at the Shelby Co. General Hospital in Center, Texas, I was born. A few minutes ahead of my arrival, my twin brother was born… stillborn. 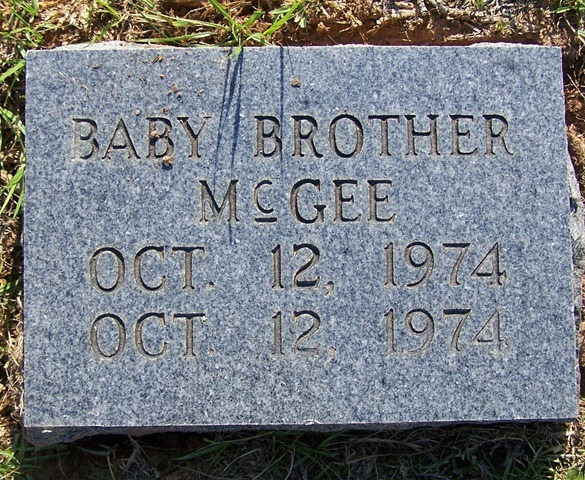 My mother and I was still in the hospital when my twin was laid to rest in Dickerson Cemetery at 2:00 P.M. on October 13, 1974; I was one day old. 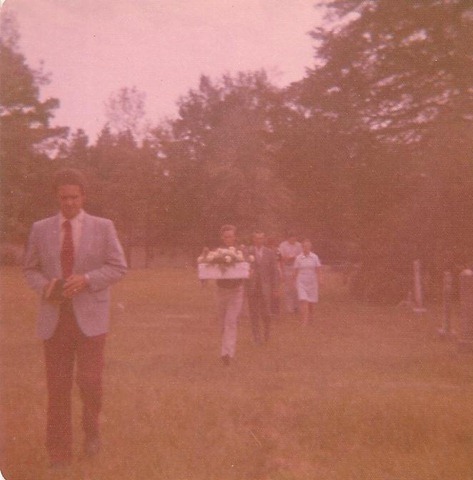 A cousin carried his tiny casket to the grave site with my dad, granny, sisters and a few others following behind. I do not know who officiated the small grave side funeral, but I know there were only a few people there, and I wasn’t one of them. He laid in a tiny little casket, as I laid in a hospital crib. My sisters told me when they looked in at him they were afraid it may have been me laying there asleep because we looked so much alike. 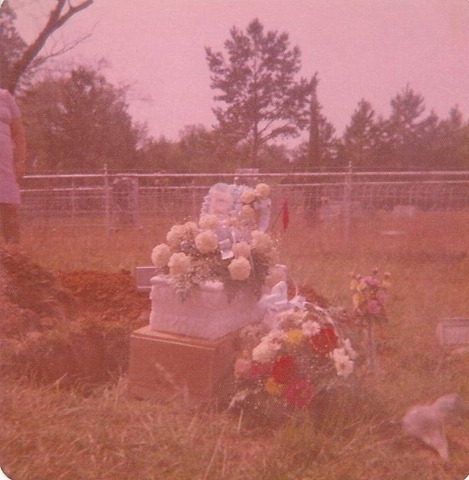 A few flowers and a tiny casket spray and the little aluminum plaque that bore his identity. The earliest memory I have about my brother is when I was attending a funeral for a family member. 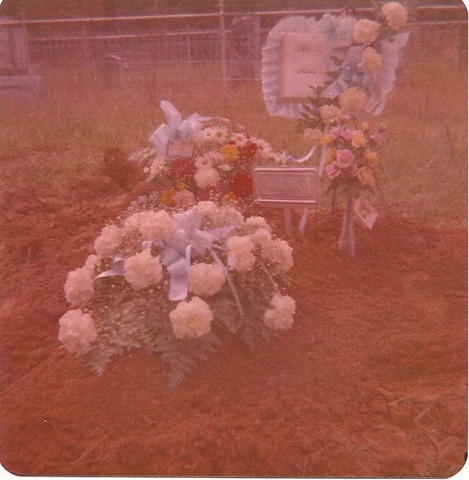 I don’t remember who was being buried, the service, or anything about that day except that I could not get anyone to read me the little aluminum plaque that was placed where I was told my brother was buried. They had laid the green fake grass carpet over my brother’s grave and set chairs on top of him and others that were laid to rest nearby. All the adults and my two older sisters were to busy to read me the plaque that was suppose to bear his name. I was near tears because I felt they were disrespecting my brother by standing and sitting on him. I didn’t understand why he mattered so little that he was being trampled on. I was almost to the point of frantic that no one would read his plaque. Of course I was very young and did not understand anything that was going on, I only knew how I felt and I felt my brother was under there and no one cared. It broke my heart and I cry now as I type this because it still is a raw emotion even though thirty or so years have gone by since that day. I think my mother finally confirmed it was his plaque but I am not even certain of that. I remember the panic I felt and that is pretty much all I remember. All my life we called him “Baby Brother.” At one point I remember as a teen going and asking mom if I could name him. She told me, “No.” I suggested the name “Jonathan” (which ironically now is the name of their first grandchild and my nephew), once again I got, “No.” for an answer. I suppose losing a child was still hard for her and she just couldn’t, “Go there.” I was told if my dad had his way and we both had survived, my name would have been Billie, maybe after daddy’s nickname “Bill” or maybe after my aunt, I’m not sure, and Brother’s name would have been “Willie” after my dad. All throughout my life I always felt I had a part of me that was missing. God is amazing though and on October 12, 1995, exactly 21 years to the day after my birth and my brothers death, I was blessed to have my firstborn child, a son, Austin. And 7 years and two weeks after Aust, came Adam, who looks so much like me but more masculine so when I look at my youngest sweet face I know what my brother would have looked like. I always thought that this was God’s way of giving me glimpses of my brother in my sons. My kids unconditionally love me which helps to fill the void left by my brother’s passing. I still think of my brother, usually around my birthday and I am still sad that he didn’t get to live, but I trust God knows all things and there was a reason for taking him. When Stewart and I was first married we went and visited my brothers grave again. It was the first time since I was a child. The plaque that gave me so much grief was long gone. His grave had become unmarked. I went to the county records and looked up any info I could find on my brother to figure out where his grave was. Stewart worked at a wood shop making furniture and such. 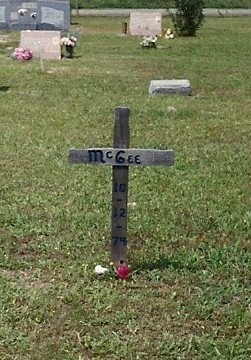 I had my husband make a cross marker out of wood to mark my brothers grave. I could not afford to buy a tombstone so wood would have to do. It wasn’t much but at least it was now identified so I would not lose it again. 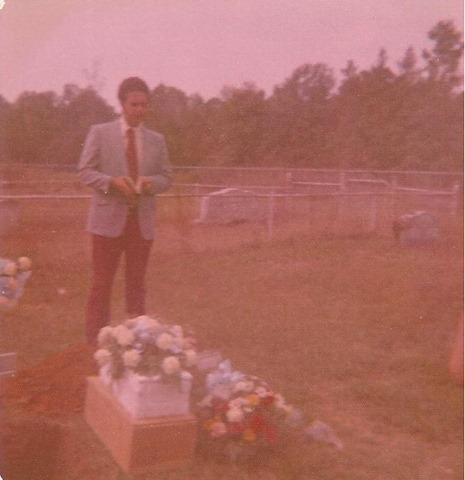 A few years later we had a family reunion at the cemetery and a cousin approached us about getting a small tombstone for his grave because they were trying to get all the graves marked and had funding to do so. I was so very happy, finally someone remembered he was there and wanted to give him a well deserved, long past do memorial. My mother told me since he was my twin I would have the honor of deciding what it should say. 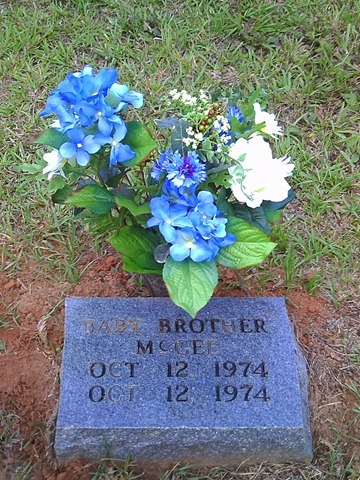 I mulled it over for a while and told her, we always called him “Baby Brother” and that is what I want on the stone. She said she wasn’t sure they would do that much but she would let them know. I was happy to know they did put it as I had wanted it. There should have been two lines under our “c” but I was just so pleased they did more than just put “McGee” on it I was not going to complain. In honor of him getting his tombstone back then, I wrote the following poem for him. And sometimes I think of you and still cry. It always seemed your loss was a very great crime. you never had to lie, learn to fight, or cuss. I was a little lost because of your death. I couldn’t understand, why I lived and you died. You was never broken, I still have to mend. While I still climb from this bottomless hole. And I thank him for our time shared up ’til our birth. I love and miss you so much my brother…till we meet again. Posted on October 12, 2012, in Inspirational and tagged Family, Inspirational. Bookmark the permalink. 10 Comments. Very very sad story Becky but I truly felt the love you have for him in your heart, displayed here, as God commands us to do with each other every day of our lives on earth. I pray for your comfort during this time of your remembrance and your sorrow. Becky this was so beautiful . never knew you had a brother much less you were a twin , but after reading this I’m sure he watches over you and family all the time. what a party there will be in heaven when you to meet again. very loving touching story thank you for sharing such a private thing. how very special.. and im sure it is a memory you will cherish forever! im sure the memory of your brother before birth will always be with you! very touching, never knew you was a twin.. Thanks for sharing..